Academic-Capital: Is Time and Choice the Fundamental Components of Economic Development? 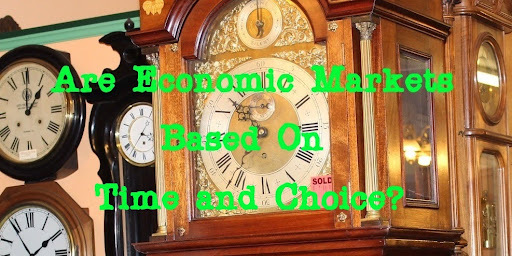 Is Time and Choice the Fundamental Components of Economic Development? Development of financial success rests in part in the psychological functioning of individuals engaged within the market. A paper by Raines and Leathers (2011) helps understand how and why markets have under defined psychological components and how these components influence the economic system. They base their analysis on post-Keynesian economics, group experimental psychology, and the works of John Galbraith. At the very core of economic development may be the concept of choice? Economic markets are not perfectly predictable as history has shown that even some of the best analysis has failed at one time or another. Mathematical explanations alone are not yet sufficient for the overall understanding and prediction of markets. Keynes observed that even though mathematics is helpful many economic choices are made on the micro level based upon alternatives. Sometimes people may rely only on wishful thinking. If we think of a large economic system we might be surprised that it is really made up of the people, individual dollars, businesses, governmental systems, culture as it influences choice, and many other small components. At its most basic level, people use their options to make hundreds and thousands of small choices every day that impact the market. For example, a person buying a toaster from China or one from the U.S. has made an evaluation and determination. The more people make a determination one way or another more the economic system is impacted and pushed down certain paths. The psychological factors have been discussed by economists for some time. For example John Galbraith stated “it can be said with some assurance that in economic, social and political matters, if the controlling circumstances are the same or similar, then so will be at least some of the consequences” (1988, p.xi; see also 1987, p.62). The development of markets doesn’t rest in economic conditions alone but also within social and political spheres. Economic development must therefore be seen as something wider than finance and when circumstances are similar it can be repeated. These systems are not stagnant and continue to develop as an entire entity. Galbraith further went on to state, “economic life is in a process of continuous transformation, and, in consequence is an uncertain guide to the present or the future” (1993, p. 105). These markets develop and continue to develop over time. Because they are always changing and developing it can be difficult to predict and measure them accurately. Snap shots through economic measurements are only a particular time and place. Moving beyond the study we can see that multiple snap shots create trends and assuming that additional pressures in the wider market do not change their trajectories the market will continue to develop on a basic course. At its most basic level the market is not made up of finance but the fundamental choices that lead to financial selection. It is the neuro-economic choices of hundreds of thousands of participants that create the right atmosphere that leads to economic development. Without changing the fundamental thought processes you cannot change the system. theories of financial markets. Journal of Post Keynesian Economics, 33 (4).